If Congress doesn’t step up with comprehensive and effective legislation to confront sea-level rise and its already-evident effects, we’re sunk, South Florida. Sunk, literally, as the ocean encroaches upon our shores in the decades ahead. Besides the emotional upheaval, the financial toll is going to be staggering. At the moment, the federal government tries to protect many Americans from the financial shock of flood damage through the National Flood Insurance Program (NFIP). But the program is in the crosshairs of a Congress that has temporarily extended the program six times, most recently until July 31. Facing a $25 billion deficit in the program, members say they’re tired of subsidizing coastal communities with cheap insurance and want big change. What they don’t say is that Florida is a donor state in the flood insurance program. Last year, Florida made up about 35 percent of NFIP policies, but we’ve received just over 7 percent of its payouts during the past 40 years. Truth is, Floridians are subsidizing repairs in states that experience river flooding — states that don’t participate in the program, yet regularly get emergency disaster funding. But that part of the story doesn’t get told. Instead, we hear that NFIP is going broke and people need to pay actuarially sound rates. Well, we got a glimpse of what actuarially sound rates look like in 2012 when Congress passed the Biggert-Waters Act to “fix” the flood insurance program. In the Keys, some property owners saw their premiums increase ten-fold. The outcry led Congress in 2014 to lessen the hit to primary-residence owners, though second homes and rental units remain a different story. And the program’s premiums are still set to increase 8 to 10 percent a year. How long can we afford that? There is a solution that makes much more sense for Floridians and all Americans — a national disaster fund, which would spread the risk and force private insurers to participate in this vital effort to protect all Americans from the huge cost of natural disasters. The flood insurance program served its purpose, but after 50 years, it hasn’t aged well. Congress created the program in 1968 to give property owners in flood-prone locations government-subsidized protection after private insurers left the market. The expectation was that premiums would pay for the program’s operating expenses and claims. But lawmakers didn’t anticipate the increase and severity of flooding disasters and the aggressive development along coastlines and in areas that flood repeatedly. To cover its liabilities, NFIP borrows money from the U.S. Treasury. Storms such as Hurricane Katrina and Superstorm Sandy cost the program far more than it had in reserves. 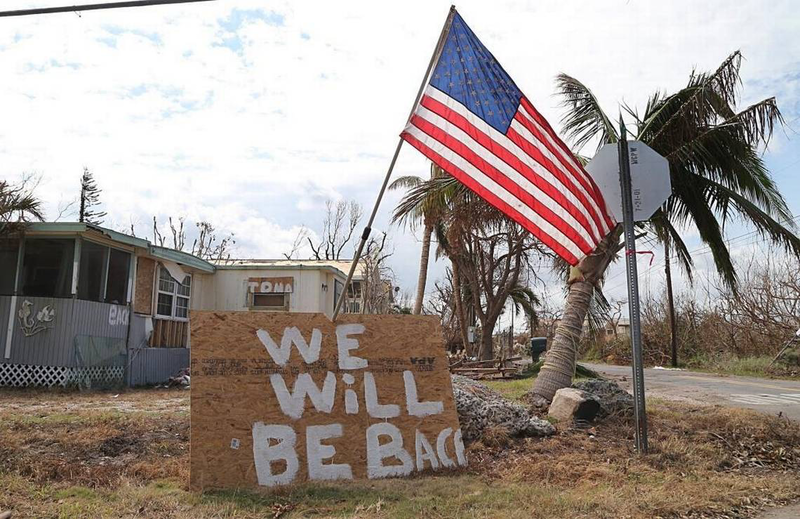 In 2017, Hurricanes Harvey, Irma, Maria added to the financial crisis. Besides the rash of costly storms, NFIP is plagued by what are called “repetitive flood loss properties.” According to FEMA, 1 percentof insured properties account for about 25 percent of the money paid out in claims. Clearly, we can no longer afford to insure properties that repeatedly flood. Last year, GOP Rep. Sean Duffy sponsored the 21st Century Flood Reform Act to stabilize NFIP’s finances and increase the role of private insurers in the program. However, it also would have raised costs for homeowners whose homes were not in FEMA-designated flood zones when they bought them, but were “grandfathered” into the program. Duffy wants to phase out grandfathering by 2021. The entire South Florida House delegation voted againstthe bill. Still, the proposed overhaul passed in the House 237-189. The Senate has yet to act. Old technology and flawed flood-zone mapping also hamper NFIP. Those FEMA maps that tell homeowners, homebuyers and insurers where flooding is most likely to occur are unreliable, says a reviewconducted by the Nature Conservancy, which partnered with the U.S. Environmental Protection Agency and the University of Bristol in the United Kingdom. The study says that the FEMA maps don’t come close to capturing the true amount of flood risk across the nation. More than 40 million Americans could face 100-year flooding and the amount of property at risk is more than double current estimates, according to the study. FEMA acknowledges the difficulty of presenting a clear picture of flood risk and wants to do better. After hurricanes Harvey and Irma, FEMA has been cautioning homeowners not to use its maps as reliable blueprints for risk. Ros-Lehtinen is right: The system must be fair. Right now, it’s not. Duffy is right, too: Private insurers must play a bigger role in providing flood-insurance coverage. Right now, they’re not. A national disaster fund would help address both concerns. First, NFIP would cease to exist. The new fund would require private insurers to participate in the calamity market, making them cover all disasters, including floods. The goal is to remove the federal government as the flood-insurer of first resort. As envisioned by insurance regulators, the fund would offer “reinsurance,” which is insurance for insurance companies because a catastrophic natural disaster could bankrupt an insurer. Florida has a working model, the Hurricane Catastrophe Fundthat provides reinsurance to private insurers, who are required use it. The fund gets its money from a surcharge on property and casualty insurance policies in the state, not from the state’s treasury. At the moment, it has $17 billion in assets. Should it run out of money, however, there is an assessment against all other insurance policies that would cover any deficit. With a national fund, states would be required to create or maintain a similar layer of coverage for homeowners. The federal government would provide the final layer of coverage if any area were hit with a Katrina-like disaster. In addition, this fail-safe would allow private insurers to diversify and invest their money elsewhere, boosting their bottom lines and lowering policyholders’ premiums. There are pitfalls. For example, if a national fund is not based on actuarially sound costs of losses, it won’t work. The flawed FEMA maps make that clear. And local communities are going to have to be accountable, pushing back against development in vulnerable areas and hardening their building codes. Although Harvey, Irma, Maria and the California wildfires captured most of the nation’s attention last year, there were more than 1,200 tornadoes in the United States last year. Montana saw a 5.8 magnitude earthquake in July, and the earth is trembling in Hawaii. Last year, the Ohio River overran its banks and flooded Cincinnati. Natural disasters affect most of the nation at one time or another. A national disaster fund is the fairest way to spread the risk among insurers, the government and property owners, who would be required to participate. Taxpayers already are providing disaster-recovery funds through FEMA. This has become a costly and inefficient model, as the agency’s debt shows. Hurricane Irma wasn’t just another wake-up call warning that South Florida and other parts of the state remain vulnerable to sea-level rise. Hurricane Irma was yet another call to action — one that Congress should heed this time. “The Invading Sea” is a collaboration of the editorial boards of the South Florida Sun Sentinel, Miami Herald and Palm Beach Post, with reporting and community engagement assistance from WLRN Public Media.